The HMS Illustrious this morning sailed into Valletta to begin a 5-day informal visit by the Response Force Task group (RFTG) in order to conduct Wider Regional Engagement. Soon after boarding the Helicopter and Commando Carrier, known affectionately by all aboard as Lusty, Malta Maritime Pilot Capt. 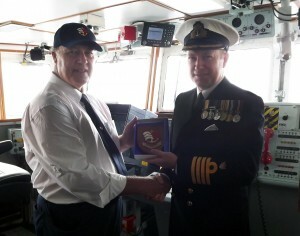 Anthony Chetcuti presented a commemorative plaque to the Commander of HMS ‘Illustrious’ Capt. Martin Connell. The HMS Illustrious visit offers the opportunity for an operational Stand-Down for the RFTG and Illustrious will take the opportunity to re-establish the very important links with her Maltese Affiliations. HMS Illustrious berthed at Pinto Wharf and will be open to visitors on 21 and 22 November between 1pm and 4pm. HMS Illustrious and her Ship’s Company are fully prepared to respond to global operations at extremely short notice. The helicopter and commando carrier is taking part in Cougar 2012, a three month deployment to the Mediterranean as part of the United Kingdom’s Response Force Task Group, exercising with key allies. Exercises will include Corsican Lion, which will test the maritime element of the UK-French Joined Expeditionary Force, and Exercise Albanian Lion which will provide superb faculties for the Lead commando group to train with Albanian forces.